December 2014 Budget Roundup = $294,304.09 or an increase of +$16,017.41 or +5.76% | Save. Spend. Splurge. This was a rough ROUGH month. Baby Bun was really exhausting me and I was not having a good reaction to it all which was affecting my relationship and to top it all off, I squashed and dealt with my emotions by shopping. The less said on the matter, the better. Anyway I worked, worked worked and that was still not enough to curb my spending because.. you know. ONLINE. Sneak preview. 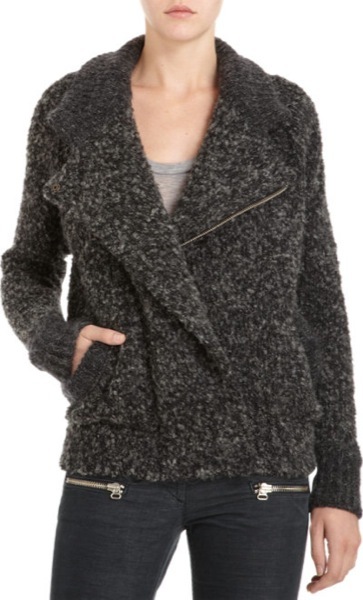 This is one of the awesome jackets I got online this month, from Isabel Marant — the Obil jacket. Mostly from my day job. OK, pretty much ONLY from my day job. *face palm* I am no good at not spending money. At least, not to the point of only being able to spend less than $500 a month on clothes. This will sound entitled but thank goodness I make a lot, otherwise I could not support my inflated lifestyle. You know where all the money went, right? I wanted to go get my teeth cleaned. Decided to get a massage instead because I JUST got my teeth cleaned like 5 months ago but I’m really paranoid like that. Seriously. 9 blankets. I’m urging you-know-who to consider returning 3 of them. At least 3. ..wait but this is every month. My spending recap from December will be so … wanton and self-indulgent. I admit it. I was $5000 off from hitting $300,000 this year but I figured I wouldn’t kill myself over it because I still have to pay taxes. January / February will not be pretty. In happier news, The Bun is doing really well. Here’s his net worth so far.. Literally PEANUTS. But I sold off a lot of stock this month (capital gains). How long more can I say this and make you believe it? Actually I really think what I need is a specific goal or treat each month. Like, if I spend money on clothes, I can’t go and get a massage every month. I’m SERIOUSLY DEBATING THIS. Carrot over stick. I’m curious how you eat good food for under 1,000? Fresh wild salmon or grazing drug free organic meats are $. It seems like you are doing a great job balancing family and work. Have you created a list of trips to take baby bun on? We’re working on the top ten travel adventures before your kids before they go off to college. Passports in place, Canadian border check, our next adventure may be Ireland. We eat very little meat. We buy about 4 drumsticks a week (mostly for me), 1 chicken breast, and maybe some chicken wings for 2 adults and a baby for an entire week. We eat a lot of beans, rice, quinoa, bread, vegetables and fruit. We do eat a lot of salmon from time to time but it isn’t a daily thing, it’s more of a treat at night (like smoked salmon). I HOPE I am doing a good job balancing family and work. It isn’t easy but it is such a treat for me to come home and see him even if it’s only for a few hours before he sleeps. I also get full Baby Bun time the entire weekend which is both nice and aggravating. Hmm.. 10 travel adventures, I like that idea. I already know I want to take him to Europe — Paris and London as we have family there, but aside from that, I don’t really have any place I want to take him yet. Not until he is much older and can appreciate it, anyway. As a baby we will just go to Paris to see family. It is also before retirement contributions but I actually leave everything in the company and withdraw very little, so essentially my company is my retirement plan. Curious — if you’re willing to share, how much do you make monthly? Out of curiosity, is this spending 100% from having a stressful month, or is it a little bit of rebound shopping from recently coming off a shopping ban? Either way, hopefully January is less stressful overall. Both, probably. I don’t do well with bans. That jacket is awesome. I am looking forward to seeing what else you purchased. It definitely pays to have a large income to offset the spending. Hope you have a less stressful January. Well… Conversely, one can say you’re excellent at spending money. ^__^;; And you’re making more than enough to afford it with no debt. I mean… Your December income to your fashion/beauty purchases only amount to 5.7% of your December expenses. I swear I’m not an enabler. Youz killing me!!!! Enabler, I need to save and squirrel away my money for the future. Sounds like just a really stressful month. Maybe diverting your money to help prevent or alleviate stress (e.g. hire a babysitter for a couple nights to spend time with the spouse, get someone to clean the house so you can just RELAX) may be well worth it to help reduce stress-buying clothes? Assuming that’s what you even want; personally, I might just keep that amazing jacket. To be honest it is my partner causing the problems trying to be perfect in everything. What I really want is for him to loosen up and to let things go.